Just wanted to tell you how much I LOVE your Pantry Manager. I loved this app before, but you’ve now made it 100 times more useful. Thanks for such a outstanding app and continually making it even better! Thanks a lot! It’s our pleasure! I currently own 2 Full paid versions on 2 phones. I have just bought a new phone and want to transfer all my lists etc over to my new phone. I am the “Owner” on the phone to be replaced. Is it possible to do this? Hi Mike, thanks for contacting us. Yes, it’s possible to transfer all your grocery data to a new phone. Just create a backup on cloud on your old phone and restore backup on your new phone. For more details please see Backup User’s Guide. Hi there software designer. I hope you can help me. I bought your program today and am frustrated at my lack of operating ability. I used Out of Milk as a shopping program, but found it tedious to type into my android phone. I usually sit down with the weekly food ads and decide to buy bananas here, milk there, salmon in a 3rd store, etc. This is the 1st shopping ap I’ve bought and I am as stumped with getting started as a previous commentor CANoll here. I am an auditory learner – watching a step by step video is my ideal way to learn. I seem to be going in circles to actually begin using this application. Also, I don’t use the Cloud – I don’t really know much about it, but have little desire to further complicate my life, as much as I might find it awesome if I were to want to learn about it. 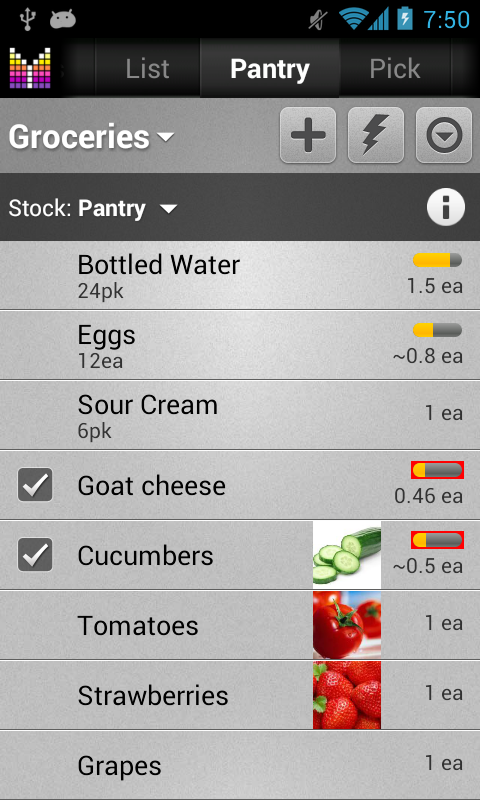 I bought the app to manage shopping – by letting me put items and their prices into lists, mostly by voice. I want to: have several stores – Costco, Safeway, etc each have their own ‘page’ that I can toggle between. I want to be able to say, ie, Costco, Beck’s Beer – 12 pak, $10.99 and Safeway, frozen shrimp $8 lb. I want to be able to clear Safeway’s list each week and add other items, by voice. Do you have any current 3.0 online videos I haven’t stumbled into? Hi Linda, thank you for contacting us. Unfortunately, there are no step-by-step videos, but we plan to make them available soon. You might want to have a look at our User’s Guide in order to get started. 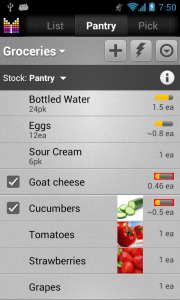 Have a look at “Manage shopping lists” section to setup your stores. To add items using voice, select your destination store under List tab > tap Edit mode button (lightning) > Mic button. Please note that cloud usage is optional in Mighty Grocery. Please let me know if you have any further questions or comments. Ok, I just downloaded Version 3.0. I can’t even figure out how to make specific store lists. I see talk of “parent” aisles etc. & people talking about their Walmart and specific store lists, but I can’t do anything but add items to grocery, pick & Favorite lists. This is my first grocery app, but without instructions specific to this version, I am lost and will not get all the benefits of this app. Thanks for giving a try to the app. Here’s the Getting started User’s Guide and other sections of User’s Guide might also be helpful. To create store-specific lists, go to All lists tab either from Dashboard or from tab bar on the top. Thanks for 3.0 ! I appreciate the ability to toggle full screen mode, that was very irritating on my tablet. Looking forward to the pantry and todo items. It appears that the pantry list doesn’t sync, is that accurate? Not sure of its value if it can’t be on my tablet and my phone, as I use both. If so, are there any plans to add that feature in the future? Randy, thanks for your feedback! Kindly note that both Pantry and Todo can sync between handsets, but unfortunately you cannot modify them at our website http://my.mightygrocery.com We do have plans for Advanced Web UI, I apologize for keeping you waiting. Looks great already, am really keen to fully try it out, was mucking around with it just to see how it works within the app and think I might have found a fault, the lightening bolt and + & – buttons don’t work under pantry, had no response from them, but if I tapped on the value I could then adjust up or down as per normal. Am going to probably spend the rest of my night now loading in all my pantry items lol!!!! Will definitely let you know how it works, as I have said earlier, don’t think it has even been a week yet of using My Mighty Grocery but am totally hooked, did my first shop last night and it worked brilliantly, note to self though, ensure phone is fully charged before you go, only had 1/4 power when I got there & was blinking red by the time I got to the checkout (I had to keep putting it in sleep mode to conserve power lol), didn’t want to get 1/2 way round and not be able to finish the groceries, won’t do that again lol!! Yet again congrats on a great product!!! Melanie, thanks a lot for your feedback! Just make sure that you have Target Qty field populated for your pantry items and Increase/Decrease buttons will work just fine. Anyway, thanks for heads-up, it’s something that we should take care of in the next update. Also, just a suggestion for a new user, please make sure that you created a Mighty Grocery Account under Menu > Settings > Accounts and enable “Automatic backup on cloud” so that all changes you make to your grocery data will be kept safe on cloud.